Two tracks on one route? 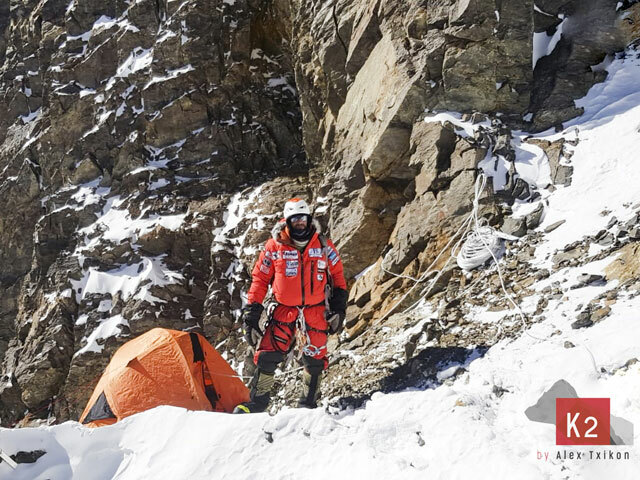 Alex Txikon has now finally decided to make no attempt via the still unclimbed K2 East Face. The ascent through the wall was “impossible” because it was too dangerous, the 37-year-old said. 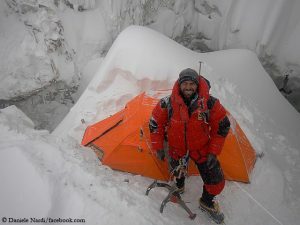 The team had equipped their route to Camp 2 at 6,700 meters via the Abruzzi Spur, Alex’ team said. It is not clear to me why this was necessary. After all, the team from Kazakhstan, Russia and Kyrgyzstan, led by Vassiliy Pivtsov, had already secured this route before. 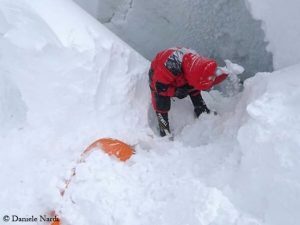 “Near us, Sherpas are fixing ropes parallel,” Pivtsov’s team informed on Sunday. Is Txikon’s team trying to signal that they are climbing independently of the other team? On the same route? If the cap fits, wear it. According to Pivtsov and Co., they reached an altitude of 6,800 meters today. Tomorrow they want to climb further up. 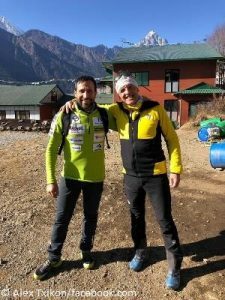 On Nanga Parbat Italian Daniele Nardi, Briton Tom Ballard and their Pakistani companions Rahmat Ullah Baig and Karim Hayat do not have to worry about a possible competitive situation. They are alone on the mountain. 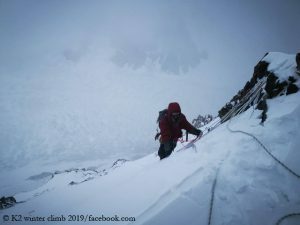 The recent heavy snowfalls – a meter and a half of fresh snow in three days – have set the team back in their efforts to open a new route via the striking Mummery Rib in the Diamir Face. After Nardi and Ballard reached again Camp 3 at 5,700 meters yesterday, they searched in vain for the tent they had left there on their last ascent. 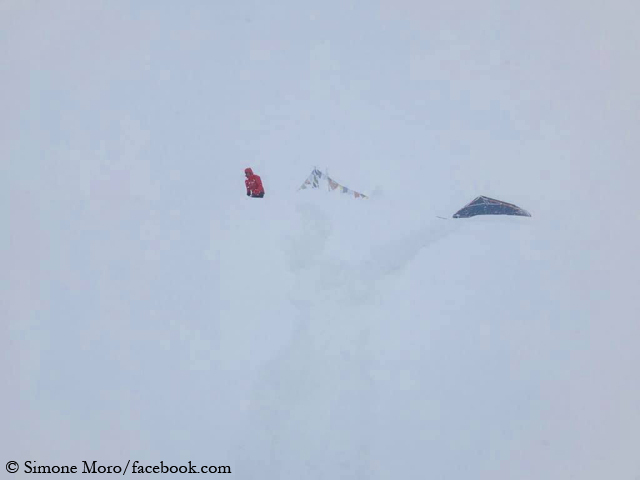 Today, Tuesday, they wanted to be back at base camp to discuss how to proceed. 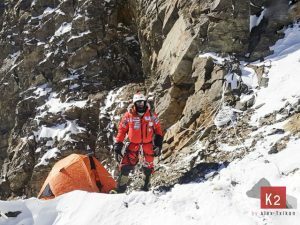 Meanwhile, Simone Moro and his Nepalese partner Pemba Gyalje Sherpa have abandoned their winter expedition on the eight-thousander Manaslu and let themselves be flown out of the base camp by helicopter. “Over the last few days the aim of reaching my fifth summit in winter was transformed into surviving this situation,” Simone writes today on Facebook. It would take at least two or three weeks of sunshine for the six meters of fresh snow to settle, says the Italian adding that the weather forecast is anything but good. 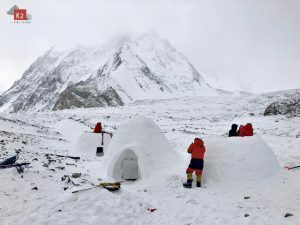 For Moro, it was a deja vu: Also in winter 2015, Moro had fled from the snow masses on Manaslu, at that time in a team with the South Tyrolean Tamara Lunger.